1)You are a baby and your mum is giving you a toy(you are in the cradle). I have sent you some 3d sketch samples. replicate any 2 of them and submit. 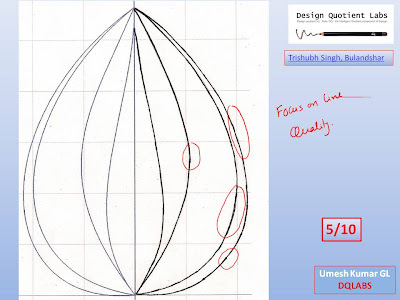 create an interesting composition with 3 circles, 4 squares and 5 triangles. color the drawing with complimentary hues. 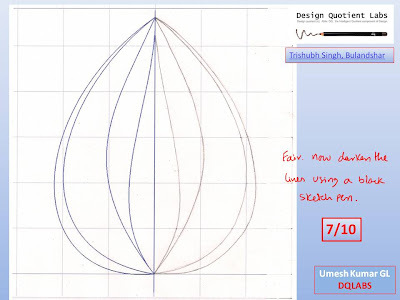 Dear Trishubh, you cannot afford to lose the skills you have acquired. what happened to your coloring skills. you have done many exercises on coloring you have improved it, and now you are back to square one. you have to practice a lot and follow the instructions more rigourously. just keep these tips in mind while making any drawing - DRAW BIG. COLOR BRIGHT. CREATE INTEREST THROUGH CONTRAST OF COLOR & SHAPE. Next assignment. i will send you some study material and worksheets. answer them and send them back. create one more composition. with only circles. submit by 27th march. good job. now make a visually pleasing 2d composition using 2 circles, 4 squares and 3 triangles. the shapes can vary in size. how ever they should not overlap. use an intersting color combination using 4 colors. submit on 25th march. call me after 3 pm today. i need to discuss your assignments. you have already covered freehand and theme sketching. what is left is 3d and 2 d composition to meet the AIEEE sylabus. secondly what architecture schools are you planning to apply?....because COA - council of architecture has made it mandatory for all schools to take in studetns based on NATA score only. infact there is a detailed list of participating institutes posted on nata.in website. i advice you to check the list. however you can give both AIEEE and NATA but out of those 2 NATA is more important and significant. comming to your drawings. i have gone through them. i feel you can do better. please Understand the questions correctly. for the pencil box question, you need to imagine yourself being inside a pencil box and not looking pencil box from top - the way you have drawn. for the 2d composition question consider 2 pentagons, 3 circles and 5 triangles and make a composition. Also while sending the jpegs, please ensure that the size of the image does not increase 150KB. 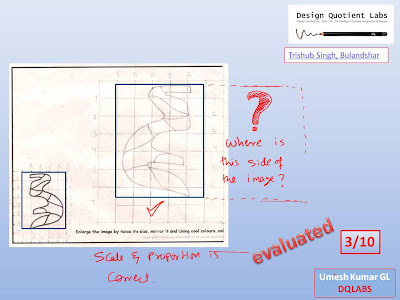 redo the assignment as per the above feedback and submit them by todays (9th march) end. i have sent you some insstructions on shading. study them and apply to the bellow scene after correcting it. submit it by 5th march. correct the image and submit it by 3rd march. 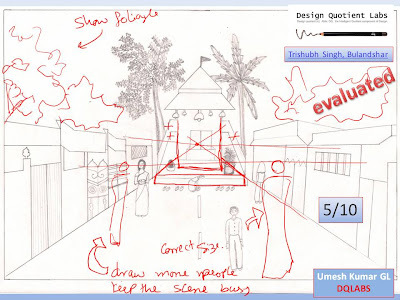 draw a temple street with all relevant details and submit it by 28th feb.
you still need to unddrstand the one ppint perspective drawings correctly. copy all the pictures in the doc i have sent you 4 weeks back and submit them by 25th feb. 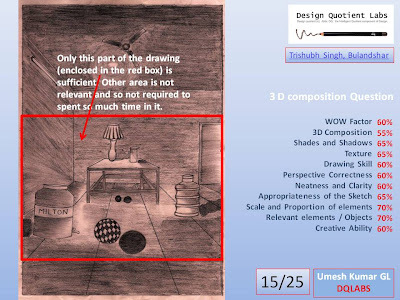 Your drawing shows lack of clear understanding of one point perspective concepts. 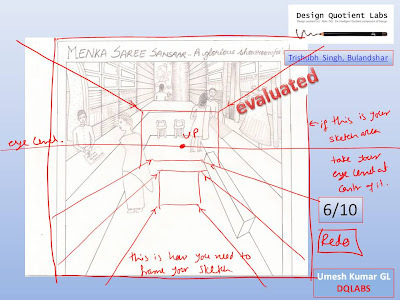 I suggest you to do all the sketches given in the document i have sent you 3 weeks back about one point perspective. 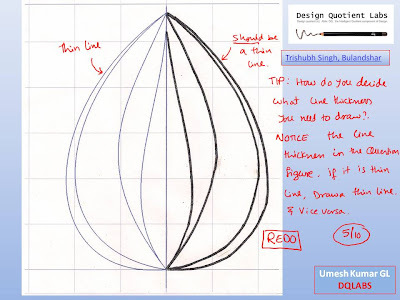 replicate all the sketches in it as per the instruction in that mail . 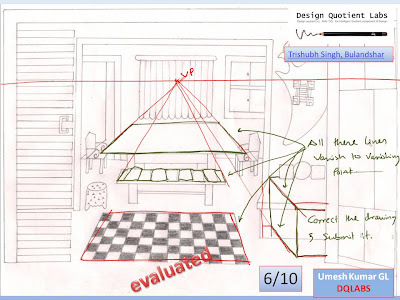 After doing those sketches, understand and implement the feedback given to you in the below sketches and submit your assignments by 18th feb. do a good job. 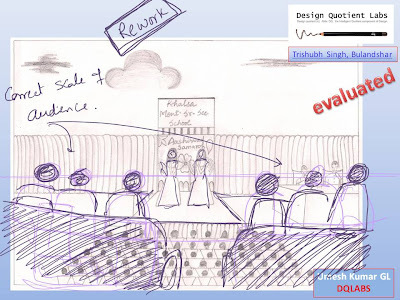 this doodle shows a more effective way of representing your idea. take cues from it and redraw the theme. 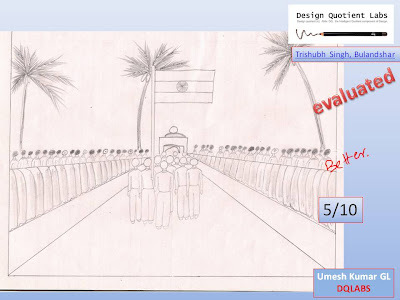 submit the drawing by 7th feb.
implement feedback and submit the drawing by 3rd feb. 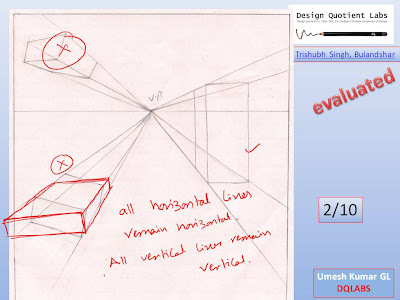 Understand the onepoint perspective correctly and redraaw the sketch. read the material i have given you one more time and follow the rules in it. 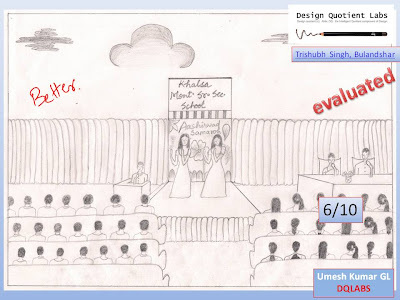 submit the drawing by 29th Jan. for clues check out Bhagias drawings. 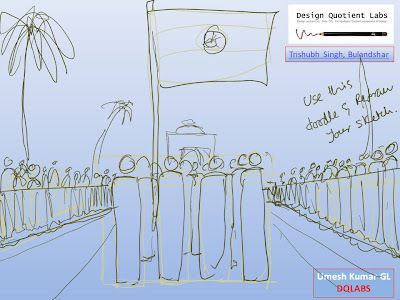 use one point perspective and draw a Theme on - Independence day Parade. 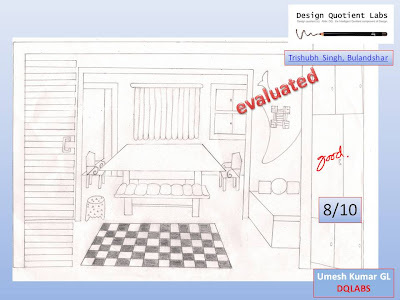 submit hte sketch by 27th jan.
correct the above drawing as per the feedback and submit it by 22nd jan. Also visualise and draw a saree showroom interior (use one point perspective concepts) and submit the drawing by 22nd jan.
Fair Job. Give attention to proportion of the drawing, line character, line quality and color application. lets proceed with theme sketching now. i have sent you some material and assignments by mail. 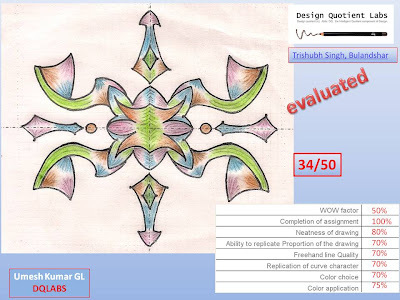 study them and submit the assignment by 21st jan.
now answer the mock test 2 freehand drawing and submit hte same by 25th jan. use all the concepts you have learnt so far in freehand and coloring. do a good job. 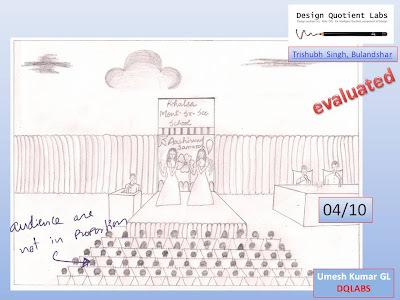 your drawing will be evaluated for 50 marks. if you score well , then we start the theme sketching. good coloring. 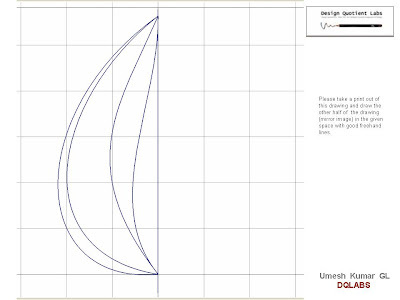 now do similar coloring for the other 2 drawing patterns you have done. 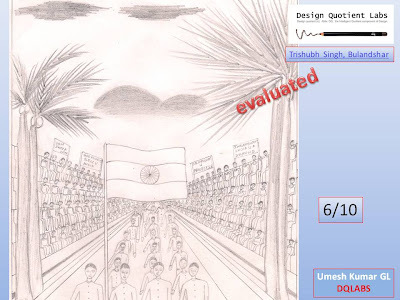 submit them by 13th jan.
recolor the drawing as per the feedback and submit them by 9th jan 2009. 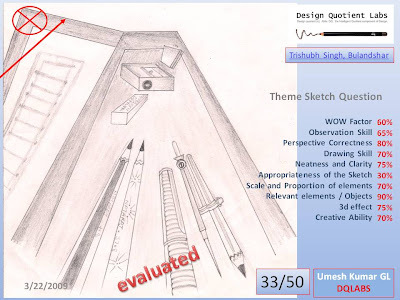 Submit the above assignment by 4th jan 2008. try to get the best freehand lines possible. make it as pecfect as possible so as not to redo this assignment. You need rigorous practice on freehand hand drawing. i have sent you some assignments by mail along with instructions. do it religiously daily. 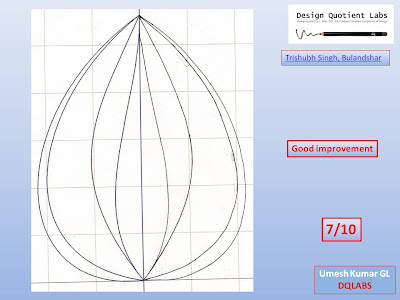 redo the above drawing and submit it by 3rd jan. give it one nice attempt and try getting the curves as good as possible. good work. submit the above drawing by 31st dec.
submit the corrected drawing by 28th dec.
you Can use any black sketch Pen. complete the assignment and submit by 25th dec. 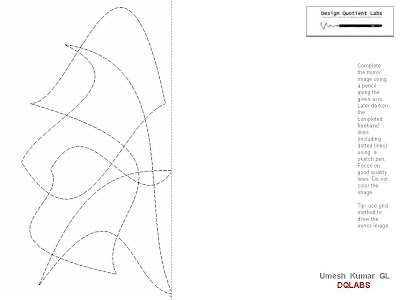 Implement the above feed baCk & Submit the drawing by 23 Dec. let us take up the coloring later. lets start working on improving the freehand drawing. i will send you some material through mail. 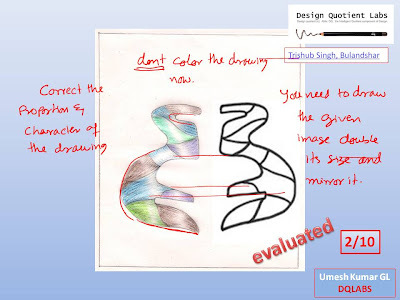 please read it and do the frreehand drawing assignment(you have submited below) using the methodology suggested in it. submit your drawing by 20th dec. PLease submit your freehand drawing asap. First of all tell me about WOW Factor. Secondly in the freehand drawing assignment,you had given me 10% for colour application.So, should I use water colour instead of pencil coluors? Can I use 2B pencil for final touch and also can I darken the outer-inner fold wherever needed? lets tackle one issue at a time step by step. lets begin with proportion and line quality. the assignments you are given will focus on this aspect. we will cover all aspects as we proceed further in the course. ideally if you use a finetip sketch pen for final line drawing, it will give a good effect. but it depends on how comfortable you are with using a pen. you can use a 2b pencil. as long as the quality of line is good, i have no issues.